The beverage and snack giant has split its stock just four times in its trading history. Long-term PepsiCo (NASDAQ:PEP) shareholders have seen their investment far exceed the return of the broader stock market. The stock is up nearly 7,000% since the early 1970s, compared to a 1,900% return for the S&P 500. Add dividends into the mix, and Pepsi's already strong return nearly doubles to almost 12,000%. That's because PepsiCo has split its stock four times in its history, with three of those moves occurring as 3-for-1 splits and the fourth one, its most recent, being a 2-for-1 trade. A stock split does nothing to change the overall value of your investment, but instead pairs an increase to the number of shares that you own with a proportional decrease in the price per share. For example, starting with 10 shares of a $10 stock immediately before a 2-for-1 stock split amounts to a $100 investment. After the split, this shareholder would own 20 shares of a $5 stock, for the exact same $100 total value. It's equivalent to adding additional cuts to an 8-slice pizza -- you end up with more individual slices, but the overall amount of food is unchanged. Even though stock splits make no difference to an investment's value, companies have good reasons to employ them from time to time. The most common of these is to lower the price of a stock that has risen far enough to put small investors at a disadvantage. Beverage rival Coca Cola (NYSE:KO) has been publicly traded for a much longer stretch, so its split history is more robust. Coke has split its stock 11 times since 1927, so a 1,000-share initial investment would today count over 9 million shares. Had Coke never split its stock, the share price would make it inaccessible to most investors. It's impossible to predict exactly when Pepsi will decide to split its stock again, especially considering that over 20 years have passed since the last split. Still, Pepsi's share price has increased substantially over that time, making the case for a split more compelling. Pepsi's stock was in the $30s immediately following the last split and has just recently crossed the $100 mark to set a new all-time high. The relative gap between the company and rivals also points to a split in the not-too-distant future. Shares are priced at more than double Coca-Cola's per-share amount despite the fact that the beverage specialist has a heftier market capitalization ($186 billion compared to Pepsi's $155 billion). In that way, a few individual investors seeking to gain exposure to the beverage industry might lean toward a Coke investment since its share price offers slightly more liquidity. 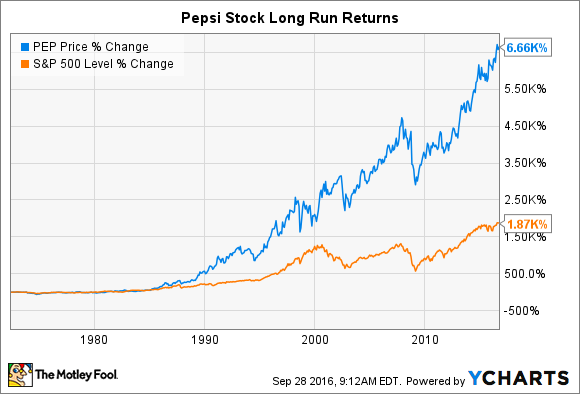 Ultimately, though, Pepsi's operating results will determine the return for investors over the next 20 years. That's why shareholders should focus on key operating metrics like organic sales growth, gross profit margin, and market share, while allowing the next stock split -- whenever it comes -- to take care of itself.